Enjoy Patagonia’s most famous hiking trails, iconic peaks, glistening glaciers and striking blue lakes in Torres del Paine and Los Glaciares National Parks. Spend a few nights based from a quirky luxury yurt camp, and dip into the vibrant capitals of Santiago and Buenos Aires on your way in and out. Upon arrival in Santiago, a private transfer will be waiting for you at the airport to transfer you to your hotel. 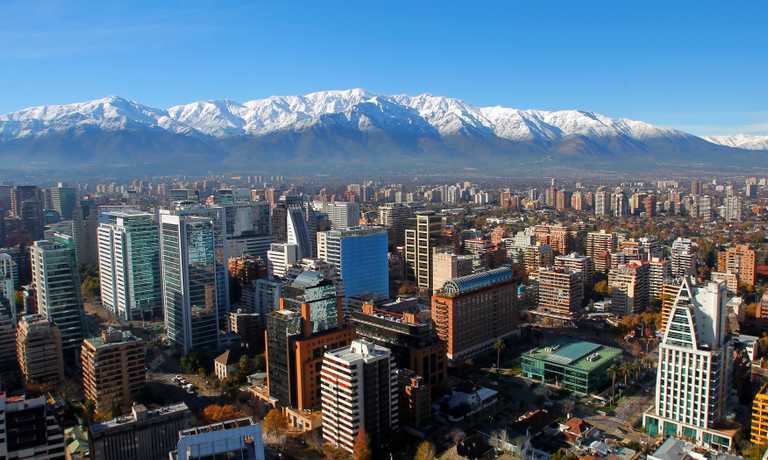 After a leisurely check-in you will enjoy a half day private guided tour of Santiago, experiencing the city's diverse highlights with all your senses. Visit historic Santa Lucia Hill, in Barrio Bella Vista. Consisting of parkland, rising 69 metres above the surrounding areas and now adorned with ornate facades, stairways and fountains, it was on this hill that the city was founded in 1541. Continue to the Paris-Londres neighbourhood, home to some of the most impressive colonial architecture before slowing down to briefly unwind with the locals and take in a curiosity unique to Santiago as you enjoy coffee at one of the notorious and racy "cafe con piernas". From there, you pass through some of the most interesting streets of the city, filled with history from the different waves of immigrants in this ethnically diverse city. Then wander around the art nouveau Mercado Central (Central Market), considered by National Geographic as one of the top ten food markets in the world and known for both its cuisine and exotic fish stores. 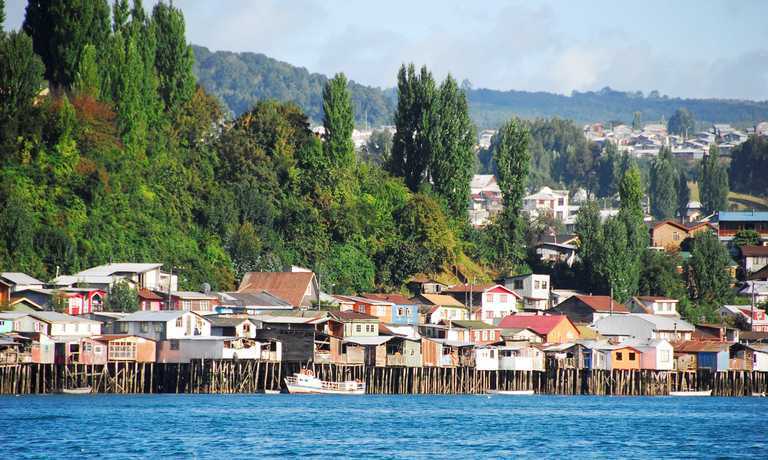 You will also visit the Vega Chica Market boasting some of the best flavours, scents and colours of this metropolis where you will try a traditional Chilean drink, the Cola de Mono. The penultimate highlight is a walk through a renowned flower market filled with colourful displays and beautiful scents before ending your tour by exploring the lovely Lastarria Neighbourhood. 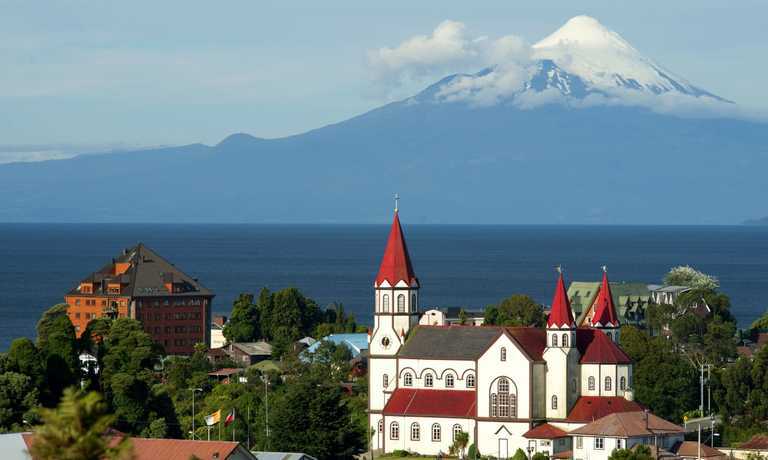 You will be transferred to the Santiago Airport for your departure flight to Punta Arenas. You will be collected at Punta Arenas airport and driven to your luxury yurt camp, located in the world-famous Torres del Paine National Park. En route you will make a couple of stops - first in Puerto Natales, a small, lively town on the shores of "Seno de Ultima Esperanza", where you'll enjoy a hearty local lunch, and second at Cueva de Milodon, a massive prehistoric cave where the remains of a giant ground sloth were discovered in the 1890's. The whole journey is very scenic, with plenty of wild birds and wonderful landscapes to be seen.The day ends with arrival and overnight stay at your yurt camp, nestled in the heart of the park with a view of the Torres. During summer the sun sets around 11pm, so upon arrival there's plenty of light to admire the Patagonian steppe with its guanacos and snow-peaked mountain horizon. Based from your quirky dome camp, you can choose which activities you'd like to do each day from the list below. Nature walks, treks, bike excursions, and more are yours to pick from - it all depends on your mood, weather conditions, and travel companions' preferences! On your way to Laguna Azul, you will have the chance to enjoy some marvelous views of the famous Torres, as well as passing through the pampas (the local steppe) where you will be lucky enough not only to spot many elegant guanacos, but also to hop out of the van and walk amongst them. After soaking up these beautiful surroundings, you will continue your drive to Laguna Azul ("Blue Lagoon"), where you'll enjoy your box lunch looking out over the lake, with a view of the three granite towers in the distance. An alternative is a bike ride in the wilderness near Laguna Azul where you will cycle among the herds of guanacos that roam the pampas. You will then jump into your van again, heading back to the EcoCamp in time for cocktail hour. After a hearty breakfast you'll set off from Ecocamp towards Hosteria Las Torres and join the uphill path to Ascencio Valley on the Tower's eastern face. Dry mountain spots, beech forests and small rivers line the scenic walk towards the valley. Your big challenge comes as you climb the steep moraine, a mass of boulders leading you towards one of the world's most famous views overlooking the Towers. The famous Torres del Paine (2,850 m/ 9,350 ft) consist of three gigantic granite monoliths, the remains of a great cirque sheared away by the forces of glacial ice. After an uphill slog, the Towers eventually come into full view, rising majestically before you, with the glacial lake visible below. Is there any better place in the world to have lunch. After feasting on the view and our picnic, you backtrack along the same trail through Ascencio Valley and return to EcoCamp. Pehoe Lake Boat Ride & French Valley: Hike After breakfast, you will be driven to Pudeto dock, located on the shores of Pehoe Lake. You will board the catamaran that will take you to the north-western sector of the Lake where you will begin the challenging trek to Valle Frances (French Valley) along a steep trail that leads to the very heart of the Paine Massif. How far in you go depends on your group's trekking rhythm. A faster pace will take you to the hanging bridge over the French River, located at the foot of the southeast face of the Massif, where you will be treated to fantastic views of the valley. You will then continue to ascend towards the upper section of the valley where you will be able to marvel at the extensive mass of the valley's geological formations: Hoja (Blade), Mascara (Mask), Espada (Sword), Catedral (Cathedral), Aleta de Tiburon (Shark's Fin) and the magnificent Fortaleza (Fortress). After your upward trek, you will pause for a picnic and relax a while. This day's adventure will end as you descend through an undulating terrain of mixed grassland and light forest which will take you to Refugio Paine Grande, located on the peaceful shores of Lake Pehoe. From here, you will board the catamaran which will take you back to Pudeto, where you will be collected and transported back to EcoCamp. During May (low season) the catamaran service will be out of operation. Therefore, the excursion will be replaced by a 15km/9mi Trek to Los Cuernos. [Read more about Los Cuernos Trek]. You will walk through the sinuous Cuernos Trail which leads us alongside the beautiful Lake Nordenskjold. During this nice walk we will have the opportunity to admire the area's exquisite flora and fauna, as we enjoy the magnificent views of the park's central lakes and the Paine's Horns, majestic black horn-like peaks of slate atop gray granite which crown the center of the Massif. You will begin the day driving across the park, admiring the view of Paine Grande's snowy peaks and the black, granite, horn-like spires of Los Cuernos. As you walk along the shores of the stunning Lake Pehoe, you will see the furious Salto Grande waterfalls where the water from Lake Nordenskjold cascades down into Pehoe. The van will drive you south to a beach along the shores of glacial Lake Grey. It is here where you will begin your hike to Cerro Ferrier, a fairly steep route taking us through a fairytale-like Magellanic forest where you might spot the Huemul, the endangered South Andean deer. You will go uphill for about an hour and a half to reach a breathtaking lookout that will offer us a unique perspective of the Paine Massive, Grey Glacier and some of the most famous lakes of the National Park. You will then walk back to Grey Beach to meet our fellow travelers coming back from the boat ride. Together, we all head to Ecocamp to enjoy a relaxed evening. You'll start your day at 8:30am with breakfast at EcoCamp and a moment to prepare your Box Lunch before boarding your bus at 10am. Your ride takes you past the Lazo Weber Estancia where you'll enter the National Park via Laguna Verde and begin our 12km hike. The Lazo Weber Trail is packed with native flora and wildlife - so have your cameras ready to snap pics of the guanacos, owls, eagles, condors, and caranchos; another bird of prey - all with the mountainous Paine range on your right. The hike is rather easy and apart from a few hills, the trail remains rather flat. You'll stop a moment to refuel by the magical Laguna Honda, and enjoy the sights and sensations of the gorgeous landscape and fresh breeze. On your way, you will hike through one of the quietest forests in the national park, a fantastic opportunity to observe native trees such as the Lenga and the Coihue. This predominantly flat trek boasts stunningly diverse natural scenery and offers the chance to feast your eyes upon a startlingly blue lake, which is secluded from all the other water systems of the area. There will be ample opportunity to spot many graceful guanacos and great grebes along the way. First you will examine the geology of the area's turbidite rock folds, before descending the isthmus which separates Lake Sarmiento from Lake Sarmiento Chico (the two lakes were once a single mass of water), walking along a slight slope, and ambling beside the eastern edge of Lake Sarmiento Chico. You will eventually arrive at an impressive bay on the western side of Lake Sarmiento, admiring a breathtaking view which could easily be mistaken for a piece of art! Then begins our ascent back to the van, and along the way you will stumble across an awe-inspiring, panoramic vista of Lake Sarmiento from its western shore, looking towards its eastern coast glimmering on the horizon. From here you drive back eastwards along the northern shore of Sarmiento Lake until you reach the starting point of the Fauna Trail. As you walk northwards along the trail we see park fauna on the Patagonian plains including guanacos, ostrich-like nandus and maybe the occasional puma print! You pass by Goic lagoon and after an approximate 5 km relaxed walk we reach the Laguna Amarga ranger station where you're picked up and driven back to EcoCamp. Hike After breakfast, you will be driven to Pudeto dock, located on the shores of Pehoe Lake. You will board the catamaran that will take you to the north-western sector of the Lake where you will begin the challenging trek to Valle Frances (French Valley) along a steep trail that leads to the very heart of the Paine Massif. How far in you go depends on your group's trekking rhythm. A faster pace will take you to the hanging bridge over the French River, located at the foot of the southeast face of the Massif, where you will be treated to fantastic views of the valley. You will then continue to ascend towards the upper section of the valley where you will be able to marvel at the extensive mass of the valley's geological formations: Hoja (Blade), Mascara (Mask), Espada (Sword), Catedral (Cathedral), Aleta de Tiburon (Shark's Fin) and the magnificent Fortaleza (Fortress). After your upward trek, you will pause for a picnic and relax a while. This day's adventure will end as you descend through an undulating terrain of mixed grassland and light forest which will take you to Refugio Paine Grande, located on the peaceful shores of Lake Pehoe. From here, you will board the catamaran which will take you back to Pudeto, where you will be collected and transported back to EcoCamp. After enjoying a buffet breakfast at EcoCamp, you'll head towards the Laguna Azul sector. From here, you'll begin your journey by 4x4 through the folds of the Cordillera Masle, from which you'll be able to appreciate the Cordillera Baguales, Salto Las Chinas and Barranca de los Toros pass. After about 40 minutes, you'll arrive at a typical "puesto" where Patagonian "gauchos" would take refuge while caring for their livestock. Here, you'll hear a short but interesting introduction to the area's history and the evolution and characteristics of its wild horses. With the help of satellite tracking equipment, coupled with your guide's experience and knowledge, you'll begin your trek, searching for the 100 untamed horses that remain isolated in this sector surrounded by mountains, lakes, and plains, in the most pristine and untouched terrain of Torres del Paine. Depending on the location of the horses, you'll choose a place to have lunch and share your stories and experiences. The experience of tracking, observing, and analysing the horses in such natural surroundings is uncomparable. Additionally, you'll be privy to fantastic views of Lago Stokes, the Cordillera Dickson and the imposing Towers. After 7-8 hours, you'll return to EcoCamp, ready to enjoy an aperitif before settling down to a warm meal. N.B. The Wild Horse Tracking is not available during winter; the excursion is therefore not offered in May & September. During May and September (low season) the excursion will be replaced by a 6km/7.50mi walk to Salto Grande & El Condor Lookout. We leave after a tasty breakfast at EcoCamp to head to Cerro Paine, a nearby mountain characterized by its two imposing peaks. We hike along the mountain for half an hour, which allows us to warm up while admiring the view of the surrounding pampas. The challenge begins as we start climbing the eastern part of Cerro Paine. We cross the lenga forest with the sound of the local birds and enjoy a few stops to observe the immense Almirante Nieto Mountain and its glacier on our left side. With any luck we will follow the tracks of the puma as the towers come into full view. A nice place for lunch, isn't it? As we are ready to start the steepest part of the hike, we leave the forest and hike on the rock. As we go up, we admire the spectacular panoramic view of the immense pampas and the mountains in the distance, like the Balmaceda mountain. We walk upward for about an hour up to 1500m/4920ft to reach the eastern peak of Cerro Paine, which offers an unforgettable lookout of the towers and the ascencio valley. After chilling and taking in one of the most striking views of the national park, we backtrack along the same trail and return to EcoCamp. You will board an early morning vehicle, sit back, relax, and enjoy a scenic ride to El Calafate. Upon arrival, you will be met and taken to your hotel. The rest of the day is at leisure. Your tour takes you into Parque Nacional Los Glaciares for views of the immense Perito Moreno Glacier. En route to the glacier you stop at the pier for a short boat trip to the south wall of the glacier. From the water level you'll get an amazing feel for its sheer size, more than 3 miles wide and over 20 stories high - a true highlight of Patagonia. We can organise a gourmet picnic lunch to enjoy on the walkways overlooking the glacier. The trip includes national park entrance fee, a packed lunch to enjoy with views of the glacier, and the boat trip. Take the morning public bus to El Chalten where where someone will be waiting to meet you and assist you to the hotel for the next three nights. For those raring to get out on the hiking trails, we recommend an afternoon hike to Loma del Pliegue Tumbado. For those looking to relax, we suggest exploring this charming town and perhaps dropping by the chocolate shop / tea house and the craft beer pub! This is the most popular trek in El Chalten, and it is certainly one of the prettiest. It leads to the viewpoint for Cerro Fitz Roy. "Los Tres" refers to the three peaks that you can see from the laguna's shore: Fitz Roy (3,405m), Poincenot (3,002m), and Saint-Exup?ry (2,558m), but the view is magnificent around all 360 degrees. After a transfer to the trailhead at Hosteria El Pilar, your guide lead you through a beech and nires forest bordering the Rio Blanco, and after 1 hour you get to the first viewpoint with excellent views of the Piedras Blancas Glacier. Forty five more minutes and you arrive at the Poicennot camp, where you cross a hanging bridge over the river into Rio Blanco camp, a base for climbers. From here, it is a 420 vertical metre hike up to the Laguna de los Tres viewpoint. The view of Fitz Roy Massif, the lagoon and its glaciers, is spectacular. A few meters away, you can also get a very good view of the Laguna Sucia. Then return to El Chalten on a path that passes past the Capri Laguna lookout. Next to the Fitz Roy, this is the other major trek, which ends with a beautiful view of one of the world's most difficult mountains to climb, Cerro Torre. The trail starts from the village, ascending alongside the river. After 20 minutes you get a view of the Fitzroy River Canyon, and see beautiful waterfalls. From here, you begin to get stunning views of Cerro Torre. After a rest at the first viewpoint, the hike continues for about an hour through a beautiful valley, with a few undulations, to De Agostini Base Camp, where some of the world's best climbers make base, waiting to climb the tower. After a few minutes more you reach the Lagoon Tower, with a magnificent view of Cerro Torre, the Egger, Standhard and Bifida peaks, and the Adelas cord with its stunning glaciers spilling into the lagoon. Then head back down the same path. You will be picked up at your hotel for a door to door shuttle transfer to El Calafate airport, in plenty of time for your flight to Buenos Aires. On arrival, a transfer will be waiting to collect you from the airport and take you to your hotel to drop off your bags before enjoying your three hour private guided city tour. Soak up the atmosphere at Plaza de Mayo, the site of Argentina's most important historical events. Visit Mayo Avenue and San Telmo, the oldest residential neighbourhood in Buenos Aires. Live and feel the original Tango in the neighbourhood of La Boca: walk along Caminito Street and enjoy the dancers and souvenir shops. See the mythical Boca Juniors soccer stadium. Visit Puerto Madero and the docks, bustling with offices, bars and restaurants. Pass through the Retiro neighbourhood and move on to see Palermo and its most exclusive residential area before finally arriving at Recoleta, the final resting place of Eva "Evita" Peron and wander through the grand Recoleta Cemetery where she is to be found. This trip can run as a group trip, with prices starting from $4,520 per person for a complete group. If you are looking to join a group or you are a solo traveller we will help to form likeminded groups of travellers. Please let us know your travel plans.